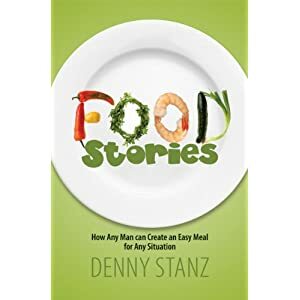 Food Stories is a fun book dedicated to any single man young, old, unmarried, divorced, or widowed. Every day, millions of men in America and abroad are confronted with a social situation that provides an opportunity for them to prepare a meal. The idea of someone else eating their cooking can be intimidating to some men. By sharing experiences that any man can relate to, Food Stories combines real life and humor to show men how cooking can be fun and provide a sense of accomplishment. Food Stories consists of a series of short stories showing men how to cook a simple and tasty meal. The real-life stories take away the fear and uncertainty for men. Whether a it s a 25-year-old inviting his buddies over for a poker game, a 35-year-old single dad cooking dinner for his daughter and her friends, or a 55-year-old divorced man hosting a Thanksgiving dinner that includes his ex-wife and her new husband, Food Stories has something for everyone. Denny Stanz grew up in a small blue collar town in Pennsylvania. He graduated from Penn State University with a degree in Pre-Law, then spent 3 years in the United States Army, including a one year tour in Vietnam as a young Lieutenant. He moved to California and began a 30 year career in the insurance industry where he served as President of the 2nd largest insurance professional association in the country, and increased the membership to its highest total ever. He served for 10 years on the Board of Directors of a Child’s Advocates organization that provided volunteers to the Juvenile Court to speak on behalf of abused and neglected children, and assist the Judge by providing information that helped in that child being placed in the safest home environment. In the past decade, he has devoted his time to various interests. He has been active in the real estate market, purchasing and renovating properties. His golf game sports a 12 handicap, and he has been a member of a male chorus well known in Southern California. He always enjoyed reading and writing, and at age 66, became a first time author with the publication of Food Stories, a compilation of true and sometimes humorous events that occurred in his life that resulted in his preparation of a meal for someone other than himself. The book is written to help men, especially those whose only trip to the kitchen is to get a beer from the refrigerator. He shares stories that millions of men can relate to, while showing them how to turn any situation into a simple and gratifying cooking experience. He is currently working on a second book, detailing his joy and heartache of being a single father. He lives in Southern California. To watch his short video and read some of his writings, please visit his website. BUY IT: You can buy this book for $14.95 on his website, and for $19.95 on Amazon. I learned that he used to sing in a chorus as well as doing other things in other areas. I find it great how his life experiences (and ending up cooking for other people but himself) made him write his book. A friend teased him for it, but it looks like a great idea and I wouldn't be surprised if his book gets real successful. I learned that Denny Stanz is writing a second book about the joy and heartache of being a single father. I learned that the author is a single dad and is working on his second book now! I learned that Denny served on the Board of Directors of a Child’s Advocates Organization and assisted the Judge to help place abused and neglected children in the safest home environment. I learned that you can do anything you put your mind to at any age. I learned that he is working on his second book. I learned that he is currently working on a second book, detailing his joy and heartache of being a single father. I learned that Denny graduated from Penn State University. I learned the author was in the military in Vietnam and I am from the United States. I had learned that Denny served for 10 years on the Board of Directors of a Child’s Advocates organization. I'm from the US. I learned that he's a poet as well. I'm in the US. Denny grew up in a small blue collar town in Pennsylvania.